Volunteers at The Marine Mammal Center on Hawai`i Island respond to and monitor Hawaiian monk seals on the island's beaches, provide animal husbandry to the patients on-site at our hospital, Ke Kai Ola, and educate the next generation of ocean stewards at community events and schools. Click on the following links below to learn more about the responsibilities and expectations of each volunteer role. *For all volunteer opportunities in Hawai`i, participants must be at least 18 years of age and out of high school. How to become a volunteer! 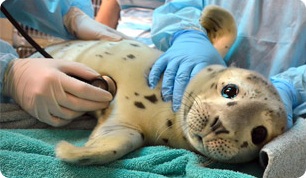 The first step to becoming a volunteer at The Marine Mammal Center in Hawai`i is to fill out a volunteer application. Upon completion of the application, applicants will be contacted within a month to schedule a phone interview. Please know that the application process is competitive and not every applicant will be accepted. *Please note that this training only occurs a few times per year, so there may be a waiting period of a few months before you may begin as a volunteer. Click Here to Complete a Volunteer Application! There is an upcoming New Volunteer Orientation scheduled on Saturday, May 11. Please submit a Volunteer Application by Saturday, April 27 to be considered for the May 11 training. Please note that we are not currently accepting applications for Animal Care Volunteers.